FAYETTEVILLE — Asked if he remains confident his young team can still make a run in conference play, Arkansas coach Mike Anderson did not hesitate in his response. "Without a doubt," he said Monday in previewing Georgia, who beat Texas 98-88 in Athens on Saturday as part of the Big 12/SEC Challenge and travels to Bud Walton Arena on Tuesday. 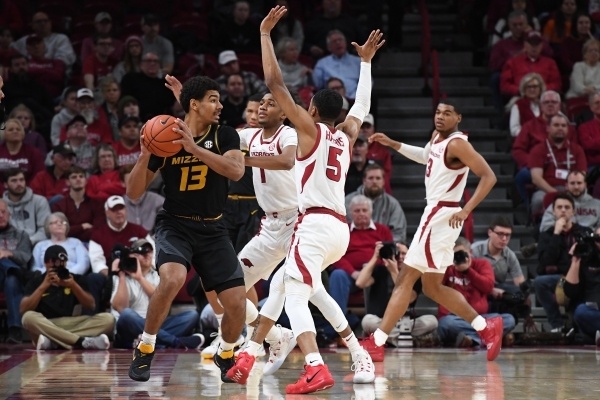 The last couple of games defensively for Arkansas had to have been a sight for sore eyes for Anderson, who watched his team allow 1.22 points per possession over a three-game span against LSU, Tennessee and Ole Miss. Missouri turned in its second-worst game of the season in terms of turnover rate (33.6 percent) and Texas Tech's (31.0) was its worst since facing Duke in Madison Square Garden in late December. Anderson's lineup that featured Reggie Chaney alongside Jalen Harris, Isaiah Joe, Mason Jones and Daniel Gafford paid dividends and changed the game in the win against Missouri. As Gafford sat the final 10-plus minutes of the first half, Gabe Osabuohien and Adrio Bailey played admirably on the defensive end.